The FSM states you should replace the $1.85 axle c-clip when rebuilding your birf. 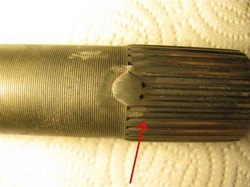 Close inspection of the clip does show some wear after 125K. The c-clip is a PIA to install. Most dealers dont stock them. If the c-clip ever breaks (never seen info on one that has broken) in the birf you will buying a $500+ birf. It is straight forward mod and works well. Just look at your axle close before tacking and notice the wear area on the axle end (see red arrow) and make sure you are behind the wear area. Also make sure the tack is smooth in all direction to avoid damage to the inner axle seal when installed.